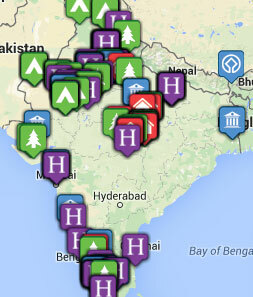 Tribes Overall: "Overall, India was fantastic. The guides were amazing, the service seamless, and the accommodation and experience was first class. " Tribes Service: "It is difficult for me to rate this because in many ways the service Tribes provided was first class. However, we were really disappointed in the lack of knowledge and guidance that Tribes provided (both via email and through its literature) on the problem of elephant tourism in India. " Guides: "Our guides in Agra, King's Lodge and Reni Pani Lodge were excellent. I would really recommend any of them. " Social & Environmental Responsibility: "It was helpful for me as I have becoming much more involved in asian elephant conservation since returning from India. We were also told by an Indian friend to take pens and sweets out to the villages and I think this helped too. Again, Tribes didn't really provide or support us with this information. Tribes Comment: Tribes does not recommend giving out sweets or pens directly to village children and recommend that if you do want to help it is better to give donations of equipment direct to he village schools which can be arranged through the lodges." This was a really interesting eco lodge that was clearly trying to create a new awareness in the area, which should be supported. Our guide was also brilliant and the food and staff were lovely. However, on the second night there was a very large, very rowdy family that stayed up drinking until 4am in the bar and were so noisy we could hear them from our lodge and couldn't sleep. This ruined this part of the trip a little for us, which is a shame. Brilliant lodge, fantastic staff, excellent food, incredible guides. Couldn't fault it. Very similar to Kings Lodge in terms of rating; the only reason I have rated them Good rather than Excellent is that they had some literature in the room promoting elephant rides, and it was possible to elephant safaris at Satpurna (which I appreciate has nothing to do with the accommodation, I just didn't know where else to put this). However in every other respect Reni Pani was on a par with Kings Lodge. "Seeing tigers in the wild will stay with me forever. They are the most incredible creatures and I understand even more how important it is to preserve them. "